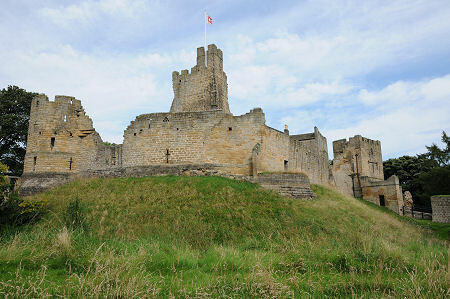 Prudhoe Castle occupies a strong defensive site which stands out from the slopes rising above the south bank of the River Tyne. The centre of the town of Prudhoe lies at higher level along the top of the ridge to the south, while the plain along the south bank of the river is now occupied by a range of industries, by the railway, and by the A695, which forms a northern bypass for Prudhoe while passing just to the north of and below Prudhoe Castle. All of this later development helps obscure the reasons for a castle being built here in the first place. In essence Prudhoe Castle's position allows it to dominate the historic crossing over the River Tyne below. Originally this was the site of a ford, and later a bridge. Today the river continues to be bridged here, by a structure linking the village of Ovingham on the north bank with Low Prudhoe on the south bank. The slightly ironic thing is that if you approach Prudhoe Castle from the centre of Prudhoe, neither the original topography nor the more recent development of the area to the north of the castle are at all obvious. The castle is heavily screened by trees, and appears from the immediate south to be surrounded by woodland. From the signposted parking area you can see parts of the castle through the trees to the north, beyond a large pond beside the approach road. Following this road brings you to the free-standing barbican, intended to help fortify the castle's main entrance. Beyond this is a causeway (originally a drawbridge) over a deep dry moat, leading to the castle gatehouse. It's worth pausing at this point, and perhaps exploring the exterior of the castle before entering. The best views of the outside of the castle are from the path leading off to the left and following the outside of the moat. 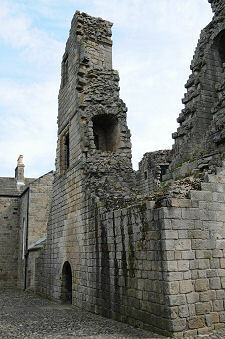 This gives glimpses of the tops of the internal structure beyond the walls, but the most obvious features are the remains of the base of the south drum tower (home to a huge conservatory in the early 1900s); and the north west drum tower, which still dominates this end of the castle. The open grassy area to the south west of the castle formed the pele yard, a service area for the castle which was also the site of St Mary's Chapel, built in the 1200s but long gone. Looking back towards the castle gatehouse from the south west corner reveals a slightly strange sight: the front block of the gatehouse appears to be leaning back against the main part of the structure at a marked angle. Back at the barbican, it is a slightly shorter excursion beyond it to the remains of the mill. The building you see today was erected in the 1700s, but appears to have been only the latest in a series of mills on the site dating back into the medieval era. 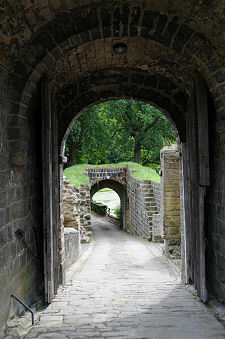 The gatehouse that dominates the entrance to Prudhoe Castle dates back to around 1150 and anyone wanting to gain access to the castle has to make their way through a rising arched passage that afforded defenders plenty of opportunity to make life uncomfortable (or extinct) for unwanted visitors. At the far end of the gatehouse passage you emerge in the the castle's outer bailey a vaguely semi-oval shape. Your first port of call on entering the castle should be the English Heritage reception and shop. This is found in the far end of the house to your left, which was built between 1810 and 1818 and effectively cuts the castle in half, occupying the site of the original range which separated the outer bailey from the inner bailey to the west. If we assume you begin your exploration back in the outer bailey, it is possible to enter a chapel on the first floor of the gatehouse by a staircase set into the wall immediately to its west. This is home to what is believed to be the earliest oriel window to be found anywhere in England. The eastern extremity of the castle is marked by the east tower, which is not open to visitors. From the early 1800s the inner bailey was landscaped with lawns and flower beds. These were cleared and excavated after the castle was placed in the care of the Ministry of Works in 1966, and what emerged were the foundations and lower levels of a great hall, measuring some 18m by 16m and effectively filling the whole of the northern half of the outer bailey. A smaller structure at its eastern end has been identified as the castle brewhouse. Another point of interest in the outer bailey is a stone standing beside its northern wall, close to the house. This carries prehistoric cup and ring marks. We've already noted that the house divides the inner and outer baileys. You can reach the inner bailey through arched passages at either end of the house, or internally via the house and the remains of the keep beyond. If you pass through the arch nearest the gatehouse, it is worth looking out for the stone carrying a carving of two faces. Opinions differ as to whether this dates back to the medieval building that originally stood here, or was put in, perhaps as a joke, in the early 1800s. The inner bailey wraps around three sides of the square stone keep, which was originally built by about 1150. It later had a chamber block added to its eastern side, and this has since been used to form the link between the ruin of the keep and the adjoining house built in the early 1800s. One of the buildings in the range along the inside of the castle's western wall houses collections of pieces that younger visitors are encouraged to use to build their own castles. The only external entrance into the keep is on its north side. This is an arch whose lack of headroom illustrates how much the floor levels have risen over the centuries. This was the original entrance to the ground floor storage areas within the keep. This floor was unconnected with the floors (or, originally, single floor) above, which had to be entered using an external staircase, also on the north side of the keep. From about 1200 the arrangements were changed so that access to the upper floors of the keep was via the newly built chamber block, and an additional floor was created within the keep. Progressing from the keep through the base of what was originally the chamber block brings the modern visitor into a display area in the rear of the house, describing the historical development of the castle. Beyond here is the hall, off which is the shop in which your visit started. A second room on the ground floor of the house, and two more on the first floor, are given over to displays of artefacts found during excavations at the castle, and to themed activity areas for younger visitors. 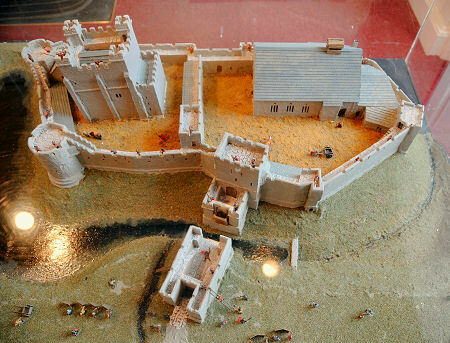 The origins of Prudhoe Castle date back to about 1095 when Robert de Umfraville, Lord of Tours and Vian and a kinsman of William the Conqueror, was granted permission to build a castle in his barony of Prudhoe. Robert de Umfraville was also Baron of Redesdale and had landholdings and castles there. This first castle at Prudhoe appears to have been built entirely of wood, on a platform which was in part artificially raised from the surrounding hillside. The castle appears to have been rebuilt in stone by about 1150, by which time the gatehouse and keep were also in place. Which was as well, because the castle was besieged by King William I of Scotland in 1173, who felt he had been betrayed by Odinel de Umfraville, the then Baron of Prudhoe. The Scots were unsuccessful in their attack, but William I was a determined man and returned in 1174, this time with an army whose numbers were boosted by Flemish mercenaries. Odinel de Umfraville managed to raise a relieving force and the Scots were again unsuccessful, and this time William I was captured near Alnwick as they retreated. In 1381, Gilbert de Umfraville, 9th Earl of Angus, died childless. In line with an arrangement he had previously entered into, ownership of the Barony of Prudhoe, and the castle, passed to Henry Percy, 1st Early of Northumberland. Henry Percy also married Gilbert de Umfraville's widow, Matilda Lucy, who in her own right owned the Barony of Cockermouth in Cumberland. Apart from a period when their lands were forfeited to the crown in the 1400s, Prudhoe Castle remained a property of the Percy family. By the late 1500s it was the centre of a farming estate. The castle had fallen into ruin by the 1700s, but its fortunes were reversed by Hugh Percy, the 2nd Duke of Northumberland, who oversaw a complete renovation in the early 1800s and arranged for the building of the house you see today for his estate manager at Prudhoe. The estate's role steadily moved from managing farmland to looking after the mineral rights in what was fast becoming an important mining area. After the Second World War the house was divided into four flats. It was passed into state care in 1966 and is now looked after by English Heritage.